The 2016 Summer Olympic Games from Rio de Janeiro ended on Sunday. I must admit that I watched none of the events, but there was more than enough news broadcast in the popular media outlets. Here are some items of interest, well known and lesser known, that can be contrasted against each other. Cost of event: $6.2 billion from government and private funding by recent account – but some accounts state a figure of $12 billion. Runners Abbey D’Agostino (US) and Nikki Hamblin (New Zealand) epitomize the parable of the Good Samaritan when in a 5,000 meter race they are involved in a fall and help each other finish the race. Gymnast Simone Biles (USA), runner Usain St. Leo Bolt (Jamaica), and swimmer Katie Ledecky (USA) were outstanding gold medal winners who were not ashamed to display or talk about the value of their Catholic faith and the gifts God has given them. Boxing event judges sent home after awarding wins to boxers who by all accounts lost the fight. US swimmers vandalize a rest stop, get caught, lie to authorities, flee country or pay fines before being allowed to leave. An Egyptian fencer breached protocol by refusing to shake hands or bowing after the match with his competitor – an Israeli. The top 14 professional athletes competing earn an average of $32 million per year. It has been many years since the “amateur” character of the games was discarded. The games now are a professional big business and bureaucracy. Sponsors pay millions in order to reap lucrative advertising or endorsement windfalls, and broadcast media outlets pay more for rights due to the high profile athletes. It is a vicious circle – higher costs for higher revenue. Unfortunately, revenue has not increased at the pace of overcoming the expenses. The extent of this is overwhelming – the 2012 London games lost $10 billion and the 2008 Beijing games lost a staggering $32 billion. Conveniently for the International Olympic Committee organization, their financial model ensures that the host country bears the brunt of the shortfall. Once the last of the Olympians and tourists leave, the impoverished residents must deal with the resulting public debt for many years, possibly the rest of their lives. While it remains to be seen what the final numbers are for the 2016 games, rest assured that Brazil is not well situated to cover any significant debt. The country is in a severe recession and is in the midst of a major government corruption scandal. Brazil can be added to the long list of other South American countries that have a failed economy in spite of a wealth of natural resources. The blame for this injustice to the citizens can be heaped directly upon corrupt government officials, allegedly the recipients of handsome kickbacks in awarding contracts for the event. Because this event has an effect not only people but also society, what do the Olympics look like through the lens of Catholic social justice doctrine? Using a few of the themes on Social Justice from the USCCB website, here is my assessment of how they stack up. Life & Dignity of the Human Person: Deficient in two areas. 1 – Participants: The IOC organization profits greatly off the abilities of the athletes, using them as objects in producing as much entertainment value as possible, as a means to a raw financial end result. At the same time, hedonism (evidenced by condom distribution) and self-worship of the perfection of humans is raised to the sacredness of a religion. 2 – The displaced residents who previously lived in the area are treated an an unfortunate “issue” with no say in the matter that has to be dealt with in order to build ever bigger and more impressive venues. Many of the displaced lose the little they have. Family, Community, and Participation: Deficient. The aftermath of the games leaves the host country in ruins, either by an exorbitant debt or by buildings and structures that serve no useful purpose and end up in disuse but still have to be maintained in some fashion. This has a significant and lasting negative impact and financial drain on society at large that also must continue to serve the needs of the common good and citizens. Care for God’s Creation: Deficient. At a literal level, Rio is an open cesspool. Part of the original commitment of preparations for the games was to institute a massive cleanup effort in order to present a clean image. In reality, the trash was moved out of sight and very little lasting improvements were made. After all the impacts of construction and displacement are factored in, the environmental situation only has become worse. Dignity of Work and Rights of Workers: Deficient. The IOC and the broadcasters became richer. The professional athletes became richer. Conversely, the rest of the athletes received at best a stipend for all their sacrifices made. Even worse, construction workers were subjected to abhorrent working, housing and living conditions and abuses, including loss of life during the facilities construction. When abuses were made visible, token actions were taken to give the appearance that worker’s rights were being considered. Isn’t it ironic that the great statue of Christ the Redeemer stood over this spectacle? Or maybe it is better to consider it as a sign or beacon for what is lacking in us and what is best for us. I believe it is time for host countries and religious leaders to say enough to this spiral of greed and human exploitation. Other than the temporary prestige for the host country, there is proven to be no lasting benefit, only increased suffering and drain on resources that could have been used for much more practical and essential purposes. More unacceptable is the exploitation of the workers and participants for the sake of entertainment, which should cause all of us to take a serious look at the moral implications of supporting or promoting future Olympic games. I’ve recently heard a proposal that the Olympics be kept in one city (or one for winter and one for summer) rather than move around, to reduce the ridiculous outlay of resources by the host country. Once the infrastructure is built then at least there won’t be additional empty stadia and velodromes littering the globe. The IOC won’t allow this because the selection of the next city is accompanied by millions (tens?) of dollars under the table to the IOC members and their cronies. As you point out this is exploitation of the first magnitude. – Usain Bolt, after being touted for his Catholic faith, was apparently photographed/videoed partying with multiple young women, after which his long-time girlfriend/fiance learned about his exploits on social media. We are all sinners, of course, but what little I heard about his response to the “scandal” was that it was no big deal where he’s from … and his exploits have continued since. – Robert Mugabe apparently ordered police to arrest Zimbabwe’s Olympians for not medaling — North Korea, too? — a la the Iraqi athletes under Hussein: http://www.indiatimes.com/sports/rio-olympics/no-medals-in-rio-get-arrested-robert-mugabe-orders-zimbabwean-olympic-team-to-be-taken-into-custody-260696.html. I recall hearing results of a survey done of Olympic athletes around the time of the 1984 games in which when asked if they could take a drug that would guarantee a gold medal but that would also kill them in 5 years, a staggering 50% said they would do it. 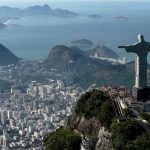 The corruption of the Olympics is much worse than that of worldly bribes and government scandals – the Olympic obsession has become a spiritual corruption for many of the athletes. For me the cons have finally outweighed the pros. This was the first Olympics in my living memory that I refused to watch at all; not even a highlight.